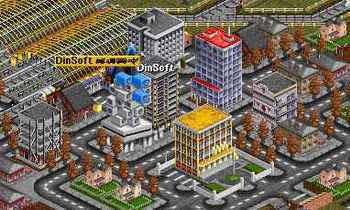 Dinsoft has now about 1600 inhabitants. There are two railroad stations and an airport. It has no industry, except the Dinsoft Power Station where the coal from Overingway Mines goes to. 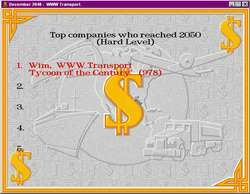 The WWW Transport Company has its head quarter still in Dinsoft. Business is going very well and we are looking forward to the next decade. February 5, there was on the news that we are in a World Recession. From many factories and mines the production goes to half of what it is now. In worse case our income can become 30 to 50% lower. In January we started to check all our stations to see if the local ratings of the transport services are good enough. Mostly it goes very well. However New Pronfingley Central had a very bad passenger rating. A few years ago there was a bus service but due too some unclear reasons it was suspended. Well let's start with a new bus service. End of May the "Global" inspection of all the station was done. The result is two new bus services and on a few places the rails were made a bit straighter and shorter. This gives a good improvement in the average speed of the trains. The next step is to check if all the trains make money. Of course, we will look also at the aircrafts, the boats and the road vehicles. We must take in consideration that we are still in a recession and therefore the income can be lower than usual. So we will look to the earnings of last year. Train 26 does it bad. The profit last year was only 160,000 dollars. This is very low; most train earnings are from one to three million dollars. We will send it to its depot and sell it. Train 47 has also a low profit, 280,000 dollars. This one we will put on another route, from Grenhattan Springs to Sentwood. July 29 this is done. In the mean time we got a message about a new Coal Mine. Very important: this means business. The closest Power Station is Slindwood West, but there is also another one: New Pindhead Power Station. This Power Station is located in the forest near New Pindhead. There is no coal supply yet and it is on a good money earning distance from the new Coal Mine. October 12 the new train (27) arrives in the Coal Mine Station. To verify if all the work is done well, we send the train direct to the Power Station. No problems, the first earnings are almost 100,000 dollars. All trains are checked for good earnings and some minor changes were made. Beginning of December a landed UFO. Of course, a few days later there is the Air force to destroy the UFO. Again something to do. Then a bus getting old and the year is over. In 2040 the earnings were much lower then before. This is only due too the recession we have. Train income was almost 75 million dollars lees then the year before. It's good that the Bank Balance is still positive, no need for a loan. The New Year started with good news: the recession is over. On the right the graph with the big dip in our income. From now on we can concentrate on the real problems. June 8 we removed a Mail Van from service; it was only losing money. August 18 a modification of the railroad for the Hunningwell Mines to Gefingway Woods. Now this train goes also direct to Fennville Power Station. 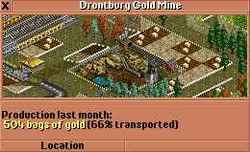 The production from the Gold Mine at Drontburg is very high. It is so much that we cannot transport more than 66 percent. Therefore we made a new railroad to the bank in Tindhall. December 5 the new train starts to load at the Gold Mine. The earnings in Tindhall are 300,000 dollars. In the mean time, just a few weeks ago, a new company started near Dinsoft. Since the recession is over our income went skyrocketing up; it almost doubled. Now we go to cleanup all small dirty things and we will try to make all transport vehicles to earn money. The new gold train is running well. The first three months it made almost one million dollar. That means four million dollars in a year. Road vehicle 4 is getting old and since we want to earn money, we don't replace it. Also the bus station in Tenington will be demolished. September 19, the two Armored vehicles were removed from service, they did not make any money. We had a look to the trains and found was that train 14, passengers and mail, between Senfingley Woods and Slunningpool only earning a few hundred thousand dollars. One of the station were it goes to has really a lot of Livestock and wheat. So it will be better to let that train transport some more money-making goods. To do so, we will do a complete rebuilding of Starfingfield Woods. December 20 the whole job is done. Train 14 has now a mix of Wheat and Livestock vans and is already earning more money than ever before. There are now less passengers, so the passengers service to Senfingley can be exchanged by more food transport. Another very good year. train income over 200,000 dollars and our Bank Balance goes almost straight up. The coming year we will try to make all vehicles making money. There is a bus in New Pronfingley that runs very bad. It seems that it cannot find its depot in time. The best is to stop this service and to restructure the railroad station to make the rails road shorter and to avoid passengers transport. March 28 it is all done. The new railroad station is now on the other side of the Printing Works. Both railroads are now much shorter and more flat. Also the city has now some place for expansion. The can build houses on the place of the old railroad station. We must not forget to modify the schedule of the trains, because they have to go to another station; the name is changed. Bus 7 was also found with a reliability of zero, so we send this one also to its depot. April 14 another UFO. A few days later it was destroyed and we repaired the railroad. On Senfingley Woods, where we removed a passengers train are now over hundred passengers waiting. It is time for a bus service from there to Senfingley. June 1 the first bus arrives. On June 3 was found that train 61 had a reliability of zero. A few years ago there was a reconstruction of the rails and these stupid people didn't build a new depot. August 1 we started with the reconstruction and October 8 it was ready but it took a few weeks more to change the railroad from Carfingley South. In this year we will reach an historical moment; our Bank Balance will pass the magic one billion dollars. There are no special things to do, always watch careful the messages and we will have a look if there are more cities with two railroad stations which can be combined. It took a few months to find something. We removed Tinston station. Now there is only Tinston Central. There are always passengers waiting. The train from Tinston went to Fledingville, which is a bit a too short distance for a train. Fledingville to Tinston Central will go much better. June 20 all the work is done. In addition, we removed a bus service from Tinston Central. This was bus 9, losing money. Train 1 is not doing so very good. In fact it runs over a too short distance; to Dinsoft. We decided to let it go to Frondhead. There we have to extend the railroad station, but therefore we have to destroy some roads from Hunley Market Transport. They don't give permission, so we go to buy that company. August 28 we started with the reconstruction of Frondhead railroad Station. The stupid round turning roads on the right is what be bought. At the left is the new situation on October 20. Much better, isn't it? Only some rails have to be straightened, therefore the tunnel at the right bottom must be extended. May 23, 2044 was a historical day, our Bank Balance pasts the one billion dollars. We found train 16 doing not so good, last year its earning was only $400,000. That is very low to our standards. January 13 we sent it to the depot and sold the whole train. February 1 we got a message about a new coal mine near Trunhill. This is good news, our last new coal trains (27) makes about 1.5 million a year. From the new coal mine we can go also to New Pindhead Power Station. May 5 the new train (16) arrives at the coal mine and may 14 at the Power Station. Earnings about 330,000 dollars. The train (64) between Saston and Starfingfield earns about $800,00 yearly. This we want to improve by transporting also food from the factory to Saston. October 12 it's all done. We only have to plant some trees to make the Starfingfield inhabitants happy. A few weeks later train 64 earned already over 1.2 million dollars. Business is going good, but earnings are not increasing a lot. We have to look for more big business, but also look at the small things. Almost every vehicle makes now money, except two busses. This we have to change, because we want to get money from everything. The two busses were set to "Full Load" at the station with the most passengers. This improves their earnings. February 6, Ship 2 had also a lot of losses. Since there are two ships on the same route, this one was sold. March 9, everything seems to go bad, production of a coal mine down, Saston does not accept anymore food. In Saston the problem was solved by connecting a Truck station to the railroad station. June 25 the UFO was destroyed. June 1 we got on offer for a subsidy on Livestock transport and a message about the closure of Flondston Food processing Plant. August 31 the railroad for the subsidy is made. When we want to buy the locomotive we got the nice message that there are too many Railroad vehicles. Another top year. We got even a subsidy on livestock transport. But there are some problems, we do have the maximum number of trains (80), therefore it will be difficult to start new services. we have to look for a low earning train to put on another service. End of March we found a place to improve: Betown Coal Mine and Trunhill Coal Mine are not so far from each other. Now there are two trains, one made 1.7 million and the other 0.9 million dollars last year. Here we go to use only one train. June 4 the job was done. One station was demolished and the other one was moved and a remote station was added. Now we have a truck loading area on a distance from the railroad station, but it pickups all the coal from the coal mine. One train was sold and the other has a few more coal cars and should make more money. August 1 we got a strange offer for a subsidy on food transport: from a food factory to a Gold Mine. This is impossible; a Gold Mine does not accept any food. Burt he idea is good, we go to make a new transport from the food plant to a nearby city. Another strange offer: food transport to a bank and also at a very large distance. We won't do anything like this, we started with a food transport to New Pindhead. Train 27, the coal train from Trunhill Woods to New Pindhead Power Station has a very low profit. We will sell this train and setup a new passengers transport between Tennpool and Runwood. October 24 we start with the railroad construction. November 19, the new train 27 is in operation. After the first return trip its profit is already 200,000 dollars. Not bad for a new train. We are getting close to the end, it is almost finished. We must earn money, how more how better. Again watching everything. Replaced bus 5 and bus 11. We've made a photo of an UFO. Then we decided to replace also all other old busses. That keeps the suprises away. So end of April there are no more old busses. July 4 we demolished the unused railroad station at Sentwood Heights. September 23 the UFO landed at Tenington and October 9 the UFO was destroyed. October 1 there is an interesting offer for a gold transport. It is just the good distance to by trucks. November 5 the first Armored Van arrived at the gold mine to pickup 16 bags of gold. November 28 we got the subsidy. This is the last year of this game. We have to continue till the real end. January 20 we sold train 21. This one was running between Dinsoft and Gadtown It made good profit, but the other train to Gadtown did not do it so well. It should go better now. This allows it also the reconstruction the railroad between Dinsoft and Kendhattan. In the mean time we modified some trains, like exchange passengers cars by mail vans. March 1 we made a bus in Kendhattan. There are many passengers waiting on both railroad stations, now they can take the bus to go from one station to the other. It looks like goes to make some profit. There are still some subsidy's to get. Why not, we can build one more train. The coal transport we did before, but the mine is rather small, we won't make so much money there, so this time we chose for the gold mine. April 22 the train is running and with just 20 bags of gold went to the Tedingville Bank. April 28 we got the subsidy for the Gold transport. The two armored vehicles from Tedingville gold mine do not make money. Therefore we sell them and make a railroad station instead of the truck loading area. Now it can be serviced with the same train as going to Wrunthill City Gold Mine. End of the game. Due too the very hard working we did, we forget to repay a loan of $20.000. After a hundred year of very hard working we reached the end of the game. It was even mentioned on the frontpage of the "Daily News" - Tycoon of the Century.